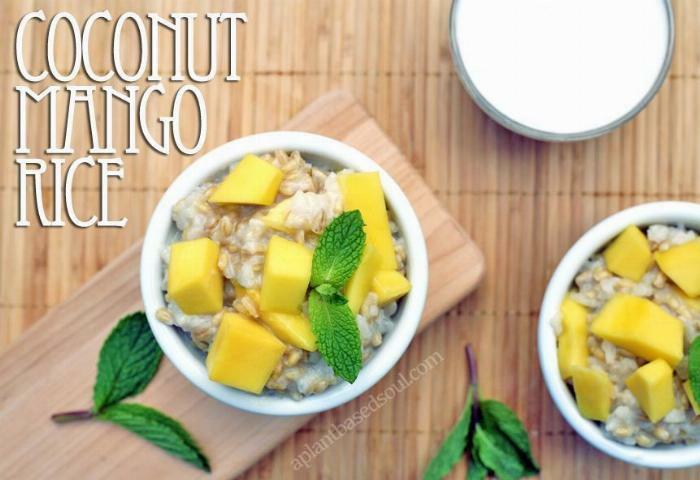 A vegan take on the famous thai mango sticky rice. 1Begin by heating the coconut milk and water in a medium pot. Bring to a boil. 2Add the rice and cane sugar and stir to combine. Cover and reduce heat to a simmer. 3Stir frequently, especially as the liquid begins to absorb. Continue cooking until the rice is tender and most of the liquid is absorbed. If you are using rice this will take about 30 minutes. If you are using millet, it will take about 20-25 minutes. If you are using barley, it will take about 40 minutes. 4While the rice is cooking, peel the mango and cut into small chunks. 5Divide the rice into individual portions and top with mango to serve.